$272.00 This item is selling for $272.00 on eBay. Welcome to JEREMY'S BEST BARGAINS Why Choose Us Outstanding Customer Service!!! Shop with 100% confidence!!!! Free shipping!!!! Lift-Up top, storage coffee table with solid wood base Faux marble surface on the table top Constructed of solid wood and wood veneers Table top lifts with a mechanical hinge Hidden storage compartment underneath The faux marble coffee table is constructed of solid wood and wood veneers to be durable and long lasting. 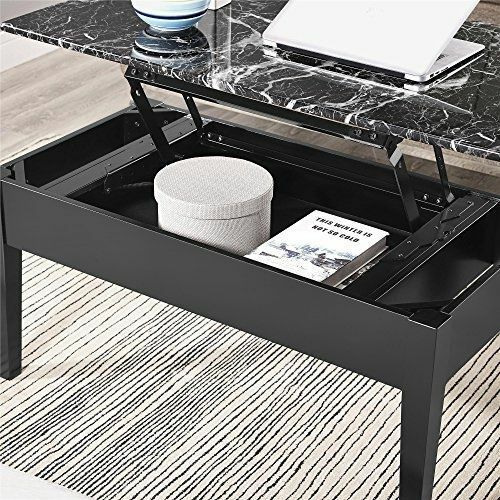 With this lift-top coffee table, there is a hidden storage compartment underneath to keep objects out of sight while still being close at hand. This compartment also allows you to keep the top clear of remotes and magazines. 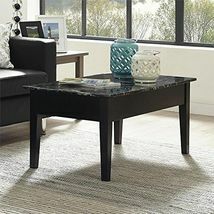 The top of the black faux coffee table can be lifted on a mechanical hinge with a smooth motion and is easy to handle. 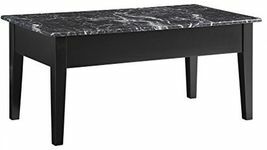 The faux marble coffee table has a faux marble surface on the top that adds elegance. 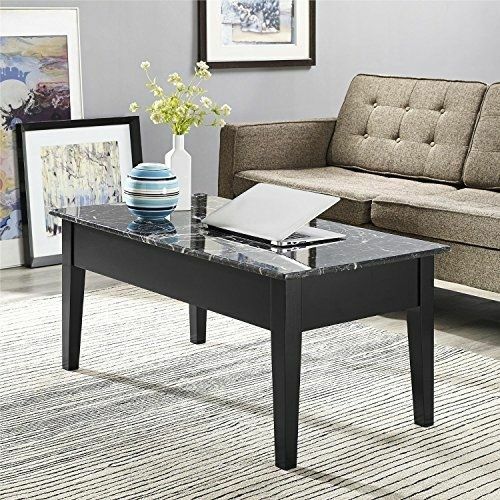 The lift top on the black faux coffee table can also be used as a tray table to eat on or play games. 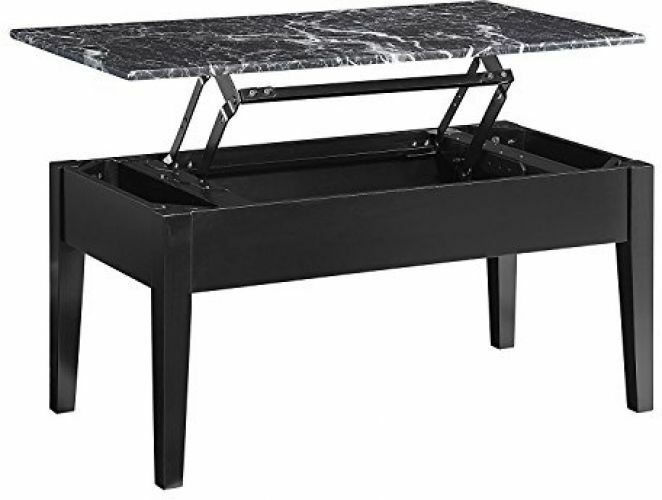 Item Weight: 42.5 pounds Product Dimensions: 22 x 40 x 18 inches Origin: Made in USA or Imported Item model number: WM4057B Assembled Height: 8 inches Assembled Width: 26 inches Assembled Length: 46 inches Weight: 49 Pounds Shipping Policy We provide FREE SHIPPING, and will only ship to the Continental United States! We ONLY ship to the confirmed address on Paypal. Delivery time is typically 2 day shipping on most orders outside of frieght items HOWEVER pleaae allow 3-10 business days. 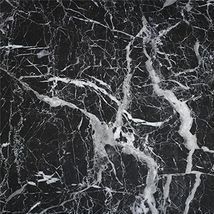 Orders are sometimes not processed for shipments on Weekends or Holidays but usually they are as we are here to satisfy you We will provide you with a tracking number so that you can feel confident and comfortable with your purchase. No international shipping. No shipping to Alaska, Hawaii, Puerto Rico, Guam, or the Virgin Islands. No shipping to Canada or Mexico. No shipping to PO Box/APO/FPO/DPO. 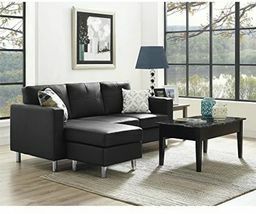 We do not offer local pickup or combined shipping services. Sales Conditions and Return Policy If you are not 100% satisfied with your purchase, you can return the item and get a full refund. On most items you can return a product for up to 14 days from the date you purchased it. However, all items purchased must be returned in the same condition as they were received in and in orginal packaging. Restocking fees may apply. Buyer is responsible for return shipping on any item that is not damaged. Please be sure this is an item you want before making your purchase.Customer Satisfaction is our TOP priority Our inventory is made up of warehouse clearance sales of popular brick and mortar retailers Our goal is to provide you with 5 star customer service. If you have any questions or concerns at any time, please contact us and we will work to come up with a solution that meets your satisfaction When you shop with JeremysBestBargains you can rest assured you can shop with confidence!